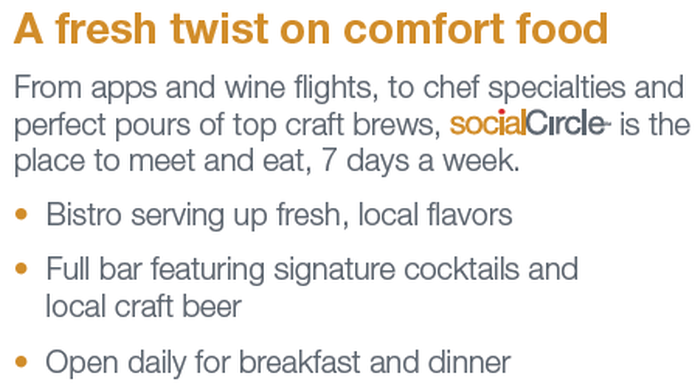 There’s something for everyone at Social Circle bistro at the Cambria® Hotel McAllen Convention Center. Start your morning with a hot breakfast buffet and wrap up your day with a tasty item from full-service full dinner menu. Seating is available in our restaurant lounge and patio. After a delicious meal—or a long day sightseeing—kick back and enjoy the inviting atmosphere of the Social Circle bar where you’ll enjoy a variety spirits and local craft beers. Looking for a caffeine or sweet fix instead? Check out our 24-hour Barista Bar with a full line of baked goods and fresh snack offerings.